The Government and ADB are nearing completion of a funding arrangement that fix the Highlands Highway as a long-term permanent solution. 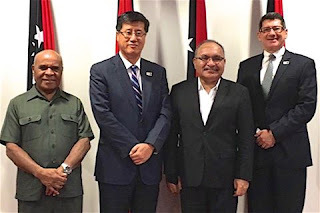 Prime Minister, Peter O’Neill, met with Mr. Won-Mok Choi, the Asian Development Bank’s Executive Director for Papua New Guinea, and Minister for Works and Implementation, Hon. Francis Awesa MP. in Port Moresby this week to discuss the arrangement. This is a partnership that will advance crucial road infrastructure in our country for which the Prime Minister said full details will be announced in the coming days, and the executive director for ADB in Papua New Guinea will finalise talks with government. “We are upgrading the Highlands Highway to international standard, and we are implementing strategies to deal with extreme weather that causes damage. “Work is already scheduled to begin on crucial parts of the Highlands Highway in the coming weeks, and this will further contribute to long-term positive outcomes for the highway,” the Prime Minister said. “There is much more that we can do to strengthen our national infrastructure, particularly our National Highways. “Following decades of neglect, we are bringing our road network back to life. “We are restoring these vital arteries so that people can get goods to market, and people can travel for work, study and family reunions. “The Highlands Highway is an important part of our national road network, considering the millions of people it services, but so too are other national highways of vital significance. “We will continue to rebuild damaged roads, and build new roads where they have not existed before. The Prime Minister expressed his gratitude to Mr. Choi for the ADB’s work in Papua New Guinea and around the region. “I would like to thank the ADB for its efforts to date to help us to build the road network infrastructure that this country needs for today and into the future. 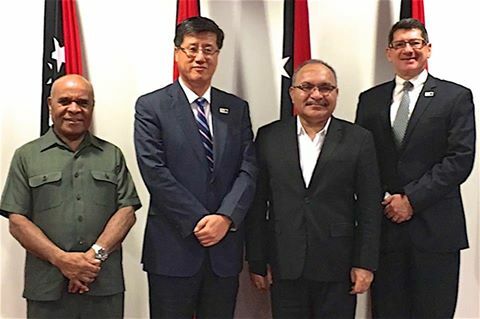 “In my discussion today with Mr. Choi, it is clear that the ADB is interested in expanding its engagement in Papua New Guinea. “Potential new projects are now being discussed with the Minister Awesa, and further announcements will be made at the appropriate time.